The old village residents really read the signs at the middle of '60s, when the country was starting to change into a tourist paradise. Slowly at first, quicker as the years passed by they started to invest transforming this agricultural region into a modern summer resort. 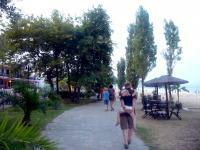 That's the main reason why thousands of tourists choose Nea Vrasna as the place of their summer vacations. Today, Nea Vrasna are part of Municipal District of Vrasna of the municipality of Saint Georgios. The Spotless, well-organized beaches, the charming view of Strymonikos gulf and the variety of modern turist facilities guarantee wonderful and unforgettable holidays. Be astonished by this panoramic view of Strymonikos gulf starting from the island of Thasos all the way to mountain Athos. Enjoy swimming to the well-organized 5klm long beaches, awarded for many years in a row with the E.U. 's "Blue Flags". Relax and be impressed watching unnumbered fishermen setting up their fishing rod, and finally to let into the ritual of fishing. Enjoy amazing sunrises, seduced by the changes of the colors in the sky. Be charmed by the outstanding moment when the August moon is rising up right from the middle of the sea, participating into many happenings taking place this unique night. Live the intense tempo of village's nightlife choosing one of many cafeterias or clubs located literally right at the sea. Taste delicious snacks at the numberless taverns located interspersed to the village. Follow up many happenings taking place at the small open theatre. Walk on the pedestrian zone, right next to sea, and watch kids playing at the children's playhouses. Visit the Church of Saint Constantine and Elena, to honor their memory.